Today we are spotlighting a member of the community, Gregg Alliss, and his son Ryan. Gregg is a severe weather spotter for the NWS in the Quad Cities, and his incredible photos are often used as illustration examples in spotter training classes. Ryan is a 27-year-old aircraft dispatcher at United Airlines in Chicago. He has a meteorology degree and drove an ISU mesonet vehicle for Tim Samaras and Twistex in 2009 and 2010. Both Alliss men are passionate about severe weather and storm chasing. 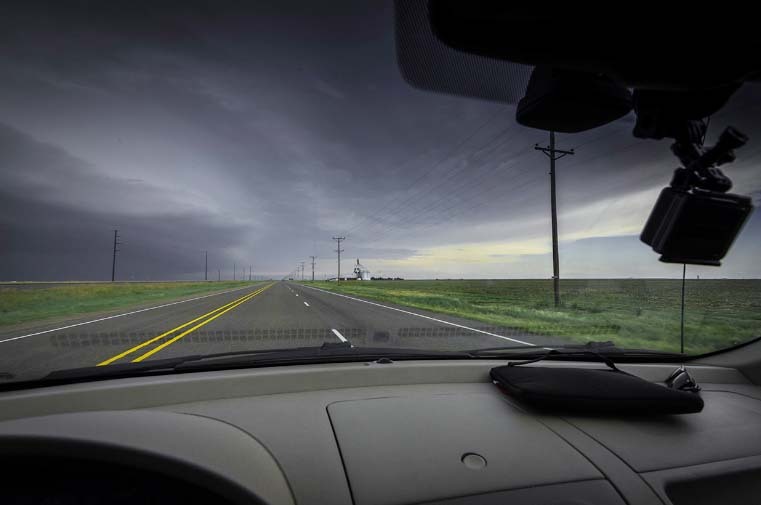 On Monday May 16, 2016, Gregg and Ryan embarked on the storm chasing adventure of a lifetime. 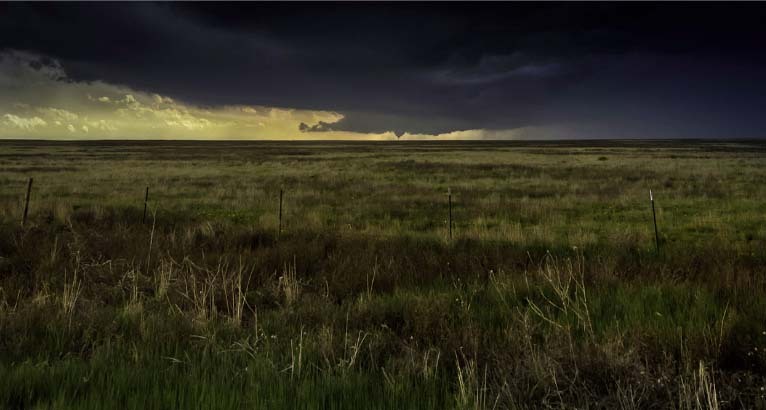 Gregg resides in Cedar Rapids, IA, but decided to take a storm chasing trip to New Mexico and the panhandles of Texas and Oklahoma. The Allisses couldn’t have asked for a more perfect trio of locations for their trip. The chase went on for nearly 6 hours, and their pictures and documentation about what happened prove just how wild weather can be. Looking west at a growing supercell from about .25 miles west of Highway 325 (N0120 Rd. ), and about 16 miles west of the town of Boise City in the far west Oklahoma panhandle. The eastern border of New Mexico can be seen in the distant background. The most intense area of this storm was located about 18 miles away in the NE corner of New Mexico. Looking north at a strong updraft structure which would produce a tornado about a half-hour later in Oklahoma. Our location here is along Highway 406, about .35 miles south of Oliver Road (A078 Rd. ), and about 5.8 miles north of US Highway 56/64 in NE New Mexico. The most intense part of the storm is about 12 miles distant, with a hail core approaching the state border. Looking NNW from E0310 Rd. at US Highway 56/64, about 2.25 miles west of Felt, Oklahoma. 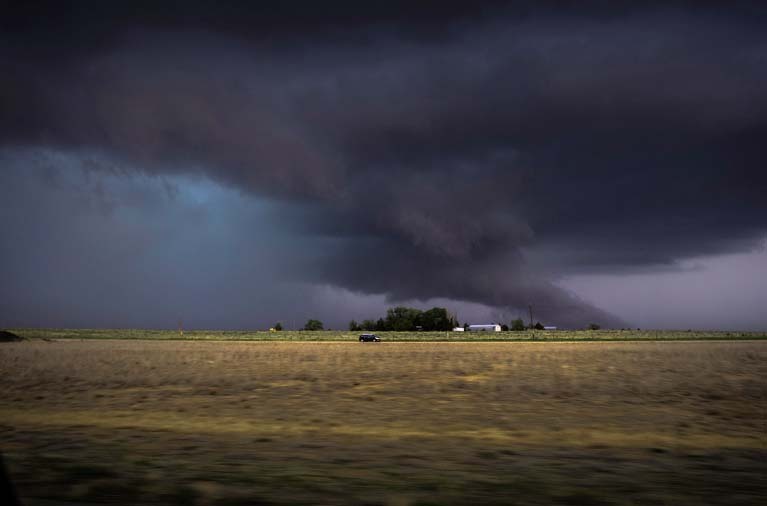 A wall cloud is in the center foreground and a rain-wrapped tornado is in the left background. The tornado is about 6 miles distant, the wall cloud about 5 miles. This severe cell organized from previously observed storm in New Mexico. Looking northwest at tornado beginning its roping stage as seen from E0310 Road at US Highway 56/64, about 2.25 miles west of Felt, Oklahoma. At this time, the funnel had distanced itself from its companion wall cloud. The tornado lasted less than 10 minutes. Looking north at the wall cloud, which is possibly making contact with the ground. Our vehicle is eastbound on the US Highway 56/64, about 1.5 miles ENE of Felt, Oklahoma. In the background is E0310 Road. The wall cloud is about 4 miles distant. 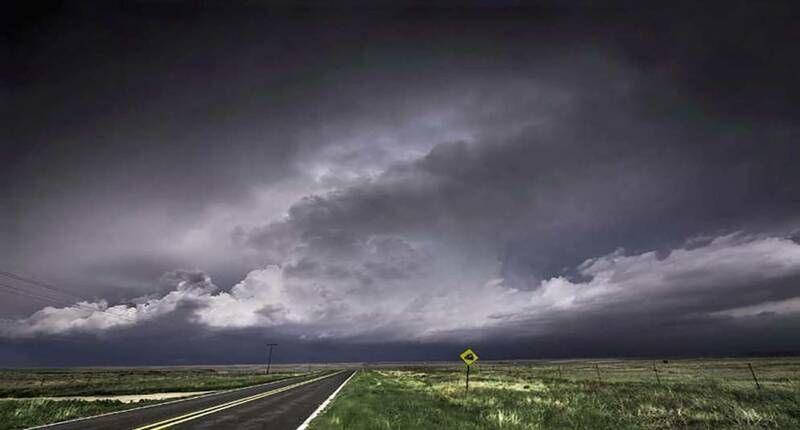 Looking northeast at the northeastern flank of an approaching HP Supercell, as seen from alongside US Highway 385, about 8 miles north of the town of Dallam, in the Texas panhandle. Hail core seen at left background is about 4 miles distant. 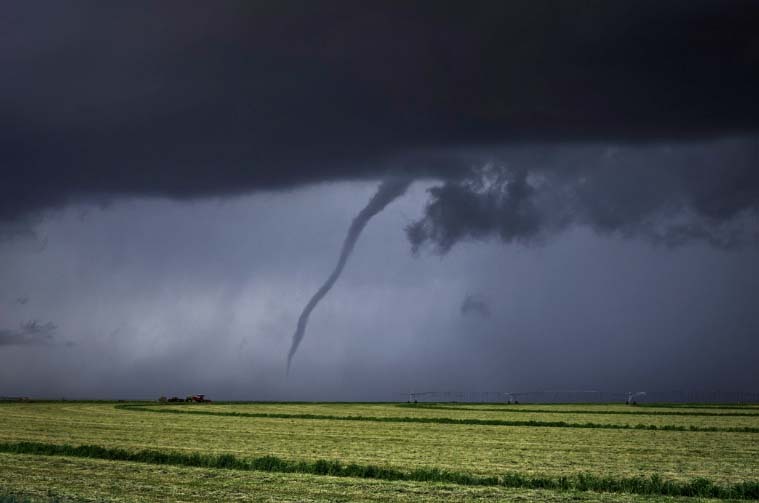 A cone-shaped tornado is viewed on the WSW horizon from alongside US Highway 385, about 8 miles north of Dallam, Texas, and about 21 miles north of the town of Dalhart. The tornado, residing on the supercell’s southwest flank, is about 30 miles distant, near the New Mexico/Texas state border. Northeast bound on US Highway 54, about 3.5 miles northeast of Dalhart, Texas and about .5 miles southwest of the junction of Highway 695. 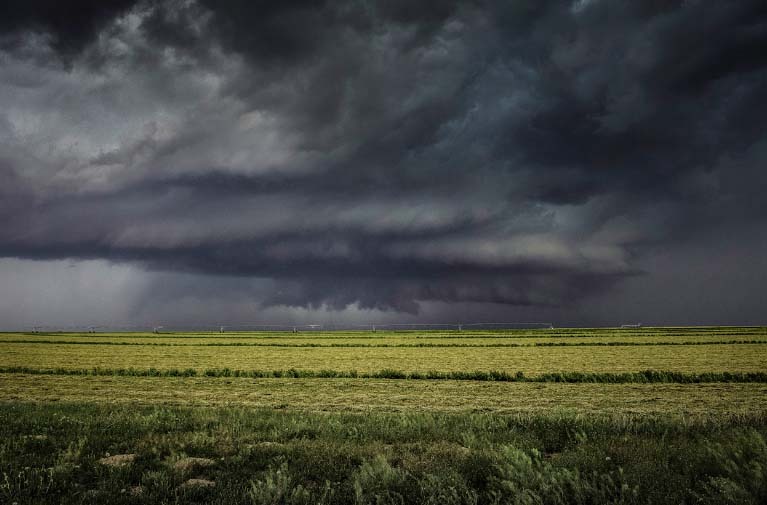 The most intense area of the HP Supercell, seen in the left background, was located about 20 miles distant. Looking west at the approaching HP Supercell, which by now is outflow dominant, and features a shelf cloud that stretches some 17 miles across. We are observing from alongside Highway 281 near Highway 1, about 9 miles southeast of Spearman, Texas. The most intense part of the storm was located at this moment in the Spearman area. Looking west at approaching HP Supercell with shelf cloud. We are located at a cellphone tower site alongside US Highway 83, about 11 miles northwest of Canadian, Texas. The most intense part of the storm was about 17 miles distant. Sunset occurred at 8:21 pm. 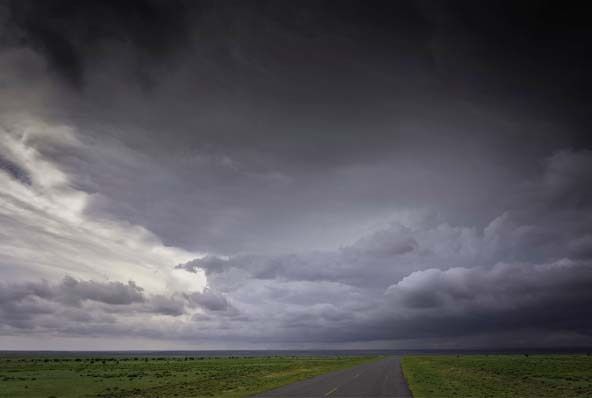 Do you have any storm chasing tales of your own? We’d love to hear them! Share your story by starting a discussion in the Amazing Weather Moments section of the Community Forum. 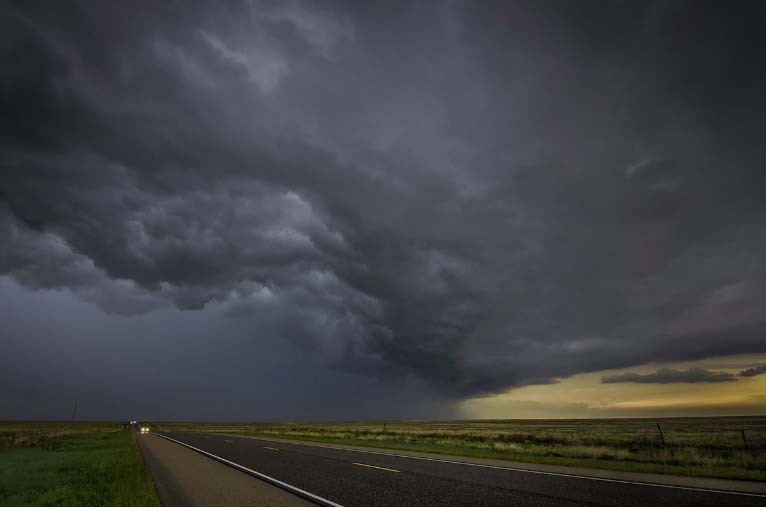 For another amazing storm chase saga, check out Meteorological Content Producer Michael Butler’s ten day storm chase across the country. I have seen videos of wedge tornadoes forming from basically a wall cloud in contact with the ground. Great pics. What happens when a wall cloud touches the ground? Is it rotating horizontally? Fabulous pictures and obviously an awesome adventure! I’m a NWS storm spotter in North central Illinois and offer do my training with the QC office, and love seeing your pictures. Thank you! I relied on my son Ryan not only for excellent navigation purposes, but also for forecasting. The ironic thing that morning was that it didn’t look at that promising for tornadoes, and yet we viewed two and maybe three. 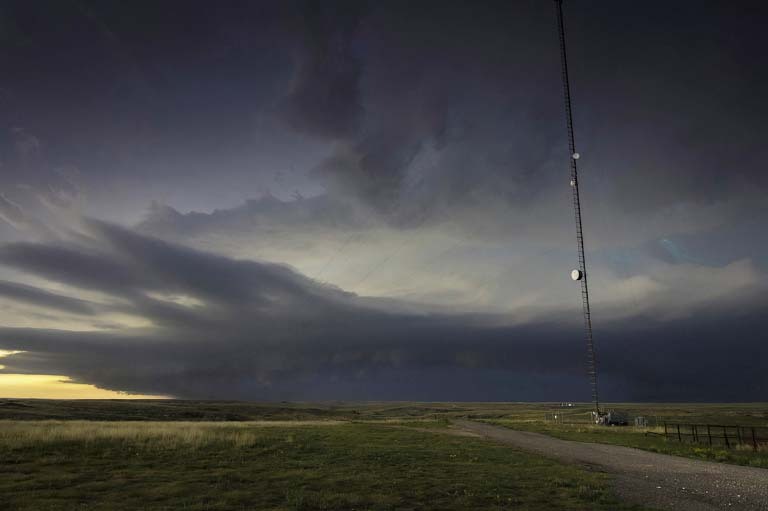 The breathtaking structure of the parent supercell would have been sufficient enough for photography purposes. Ryan’s navigation kept us out of harm’s way most of the time, with only one close call being caught in an RFD cut in Texas, just south of the Oklahoma border.